With all the long and ever more complex lists of things to do on Nomadness, around the homestead (an upcoming blog on the garden project is in the works), for Camano Sail, and trying to keep an eye on the precision chewer/speed digger Zuben, I find myself overwhelmed. I stand around staring blankly at the dishes, the yard, the boat, the lab, and into my sweetie's eyes asking, "uh... what are we going to do today?" Thankfully, we have friends who are more sensible and invite us out for fun on the water on these long warm days of late spring. Last month, we tried to get Nomadness from Oak Harbor over to Camano for a potluck with friends and to share the water with Adventuress but alas we didn't make it due to extensive biological growth on the hull. We did get it cleaned off by some spry young divers, and made a little venture around Saratoga Passage the following day. 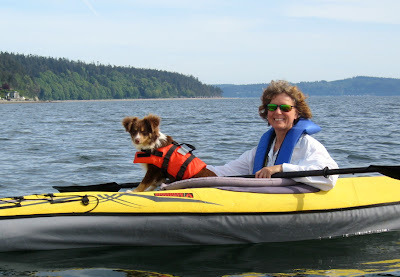 And we have gone out kayaking off the west side of Camano in the past couple of weeks too. Steve and Bonnie were in the pedal powered Hobie kayaks, so they left me in their wake quite rapidly. But I enjoyed paddling around slowly, carefully, taking in the sights and sounds of gulls and gently breaking waves on the beach. It was a gorgeous day to expose Zuby to the kayak. He even got to swim for the first time. He isn't crazy about it yet, but I'm not giving up on making him a water dog! 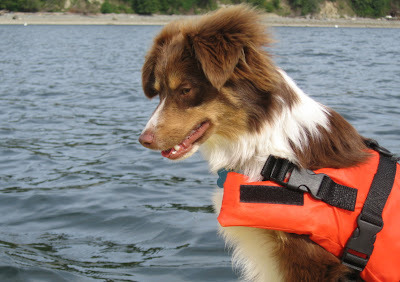 He sure looks cute in his PFD (which he is rapidly outgrowing)! Awww....this and the previous photo by Steven Roberts. I also spent a day with Lawrence and Bonnie moving She Oughter from the west to the east side of Camano Island. Lawrence had a three day charter by a company testing some new submersible robots. He needed to set a buoy so he would not have to relaunch each day. We spent the entire day getting the cars set for transport logistics, launching at the busy Camano Island State Park, setting two danforth anchors with the right orientation and depth in the uneven bottom of Port Susan, and hanging the buoy off them. It was quite an elaborate process, but it turned out to be a wonderful day on the water. And as is usual with working for Camano Sail, I learned a lot. I am not a big fan of motor boats, but I had blast zipping around in this thing. Zuby didn't like the sound of motor when revved up to high RPMs and whined. Bonnie suggested that supersonic sounds might be hurting his ears, so we slowed down a bit and everybody was happy. This boat can be beached, and with the cool landing craft bow, you can step ashore like a princess and never wet your feet! Gotta love that! As far a motor boats go, this little boat is really quite cool. Made by Ottercraft of Kingston, Washington, it is rugged and functional. 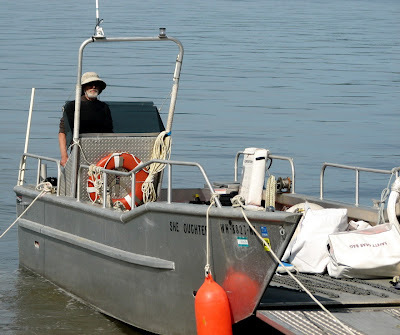 They are sturdy workboats used by the coast guard, tribal police, shell fish companies and more. Captain Baum on She Oughter. The main thing for me right now is to just get out on the water more. It is too easy to get sidetracked with all the "projects" and let the sunny days pass without getting a taste of why we're doing all this work in the first place!